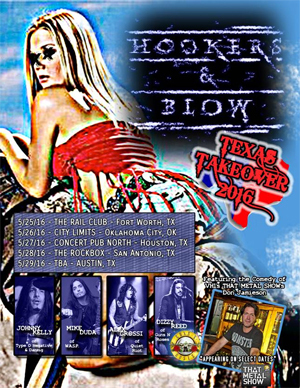 HOOKERS & BLOW, the band comprised of Dizzy Reed (GUNS N' ROSES), Alex Grossi (QUIET RIOT), Mike Duda (W.A.S.P., HOTEL DIABLO) and Johnny Kelly (TYPE O NEGATIVE, DANZIG), have announced a string of southern tour dates in late May dubbed the "Texas Takeover" Tour. This will be the first time HOOKERS & BLOW have performed in Texas since the band's formation over a decade ago and will be the last HN'B shows before GUNS N' ROSES embark on their Not In This Lifetime US tour and QUIET RIOT gets their US summer tour season underway. Comedian Don Jamieson will be performing at the Houston and San Antonio shows before joining FASTER PUSSYCAT for their 30th Anniversary Celebration – "The Dirty 30 Tour", which is set to kick off in LA in mid-August.